This patch evolved from two previous patches - associated with early Navy squadrons. This patch was eventually approved by the Office of the CNO in 1967, when the squadron was redesignated as VA-196. The ace of spade portrays the death-dealing blow of an A-6 squadron in combat. The devil represents the threat of the squadron to its enemies. The bull horns signify the stamina and tactical pursuit exercised by the command while in combat. The squadron nickname from 1948 to 1950 was The Thundercats. From 1950 on it has used The Main Battery and The Milestones interchangeably. The squadron's origin dates back to its establishment on July 15, 1948. VA-196 was first established as Fighter Squadron ONE FIVE THREE (VF-153) - The Thundercats and flew the Grumman F-8F-1 Bearcat. The squadron went on to fly the Vought F4U-4 Corsair before being redesignated VF-194 on February 15, 1950, when they transitioned to the Douglas AS-1 Skyraider. On December 11, 1951, the Thundercats launched from the deck of the USS VALLEY FORGE (CV-45) on their first combat missions into Korea. By 1955, the Thundercats had so distinguished themselves as experts in the air to ground role that the squadron was redesignated as Attack Squadron ONE NINE SIX (VA-196) on May 4, 1955. The squadron's nickname was changed to the Main Battery, harking back to the days when a battleship's largest and most dependable gun mount was bestowed this distinguished title. The Main Battery began its thirty year association with the A-6 Intruder on October 1, 1966. The squadron was homeported at Naval Air Stations Alameda, Moffet Field, and Lemoore in CA before moving to NAS Oceana, VA, on May 1, 1966 to receive training in their new aircraft. The squadron's first Grumman A-6A Intruder was accepted on October 1, 1966. Shortly thereafter, the Main Battery made NAS Whidbey Island, WA its permanent home on 15 November 1966. Throughout the mid 1960s to the early 1970s, the Main Battery deployed seven times in combat over the jungles of Vietnam. On most missions, the Intruders flew as single aircraft, at night, deep into enemy territory. With an average deployment cycle of over eight months, VA-196 flew more sorties and suffered greater losses than any other sea-going squadron. 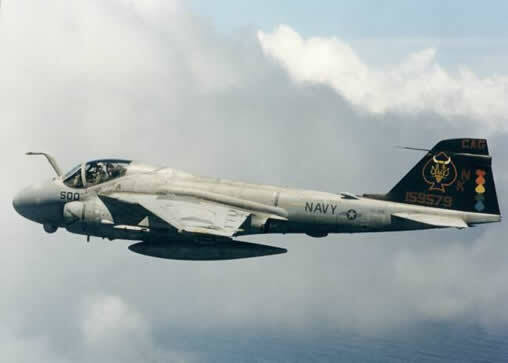 While serving in the Vietnam theatre, VA-196 participated in LINEBACKER I and II, Operation END SWEEP, and provided air cover from the deck of USS ENTERPRISE (CVN-65) during the evacuation of Saigon in April of 1975. The squadron was decorated 31 times with the Vietnam Service Medal. Since then, VA-196 has made 14 peacetime deployments, including one "Around the World" deployment in 1985 aboard USS CORAL SEA (CV-43), and two Northern Pacific deployments aboard USS CONSTELLATION (CV-64) in 1986 and 1989. 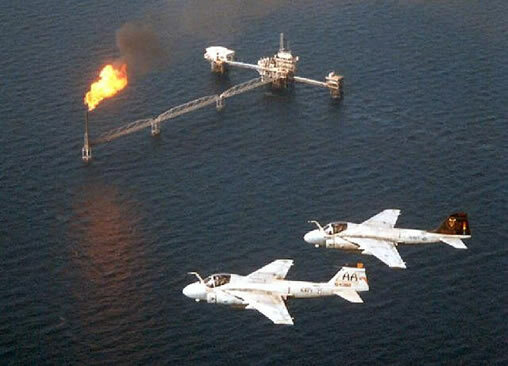 Main Battery Intruders participated in peacekeeping efforts in Uganda in 1977 and South Korea in 1979, drug interdiction operations off the coast of Nicaragua in 1983, and Operation EARNEST WILL in 1987 (providing air cover for reflagged Kuwaiti oil tankers). August of 1990 found the Main Battery deployed to the Northern Arabian Sea aboard USS INDEPENDENCE (CV-62), flying to deter Iraqui aggression in Operation DESERT SHIELD. VA-196 deployed to that troubled region again in 1994 aboard USS CARL VINSON (CVN-70) in support of Operation SOUTHERN WATCH. The Main Battery departed NAS Whidbey Island for its 30th and final deployment on May 14, 1996, embarked in USS CARL VINSON (CVN-70) with Carrier Air Wing FOURTEEN (CVW-14). While at sea VA-196 flew missions in support of Operation SOUTHERN WATCH, enforcing UN sanctions in the Iraqui "No Fly Zone" below the 32nd parallel. The squadron also participated in exercise RUGGED NAUTILUS, a joint exercise that successfully deployed a Joint Forces Air Component Commander (JFACC) afloat and conducted joint operations with an Air Force Expeditionary Force (AEF) and a Navy/Marine Amphibious Group (ARG). During WESTPAC 96, pilots and bombardier/navigators finished the final deployment of a west coast squadron by winning the prestigious "Top Hook" award, symbolizing the best carrier landing grade performance of any squadron in the Air Wing during the entire deployment. Attack Squadron 196 returned its Intruders to NAS Whidbey Island on November 11, 1996, almost 30 years to the day from when the first Main Battery A-6As came to Oak Harbor. Attack Squadron 196, in conjunction with Attack Squadron 75 at NAS Oceana, VA, disestablished on 28 February 1997. The Main Battery was the last operational Intruder squadron in the Pacific Fleet. During its commissioned service, VA-196 won every major award offered for operation and safety excellence. These accolades include the Admiral C. Wade McCluskey award, the Battle "E", the Safety "S", the Norden Pickle Barrel Award for Bombing Excellence, and consecutive victories in the last two Commander, Attack Wing, U.S. Pacific Fleet Intruder Derbies in 1994 and 1995. The Main Battery proved itself to the the tactical leader of the Medium Attack community to the very end. Throughout the 48 years of dedicated service, the Main Battery was involved in nearly every major military engagement. The squadron made 30 deployments and earned 73 unit commendations. It was a bittersweet honor to be the last operational A-6E Intruder squadron on the West Coast. There have been a total of 41 Commanding Officers of The Main Battery. The first, CDR T. D. Harris served from 1948 to 1949. The last was CDR D. J. Frederick He served from 1995 until 1997. Copyright 2019 Intruder Association. All Rights Reserved.